Ghana and Burkina Faso have agreed to improve their trade relations during a two-day visit of Burkina Faso President Roch Marc Christian Kaboré in Ghana. Kaboré’s visit sought to bolster bilateral ties and explore opportunities where the two nations can collaborate for the good of their people, as well as solidify some decisions that were taken by the two governments last year. The two countries have also agreed to expedite the establishment of the Joint Commission for Cooperation that would speed up agreements in the areas of rail and road transport, agriculture, water management, trade and energy. During a joint press conference after their meeting, President Nana Addo disclosed that the two countries were in talks to find a lasting solution to the annual spillage of the Bagre Dam in Burkina Faso, which often has disastrous consequences for communities downstream, especially in the northern part of Ghana. Another outcome of the talks between the two heads of state is an agreement on quarterly ministerial meetings to address issues of mutual concern. The two leaders have also agreed to collaborate with the support of ECOWAS to establish a joint border post to facilitate trade and free movement of their people, goods and services. They also decided to work together in support of the establishment of the Continental Free Trade Area (CFTA) under the auspices of the African Union. 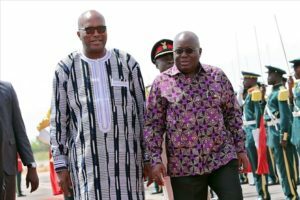 President Nana Akufo-Addo conferred Ghana’s highest honour, Companion of the Order of the Star, on President Roch Marc Christian Kaboré, in recognition of his distinguished leadership and commitment to the progress of his country, Burkina Faso, West Africa and Africa at large. “He is one of the outstanding figures of modern Burkinabe history,” President Akufo-Addo said during the ceremony. Posted by Emmanuel Agbenonwossi on September 20, 2018. Filed under Zoom. You can follow any responses to this entry through the RSS 2.0. Both comments and pings are currently closed.